Last weekend saw both the start of the UK summer festival season and the abrupt end to one of its festivals – forced to close early due to two drug-related deaths and over 15 hospital admissions. Sadly another two young adults have been added to the growing list of festival drug casualties. This piece was originally published by VolteFace. You can read the original here. This same weekend, further north, a teenager died on a camping trip and in a separate incident, another was hospitalised after a party in a park. What all of these tragedies have in common is that the fatalities involved the reported consumption of pills bought as ecstasy. In 2016 there were six known festival drug-related deaths but by 2017 the festival death toll became more difficult to ascertain due to a creeping vagueness in festival reporting which can only be assumed is to avoid reputational damage. Whilst drug use tends to be higher at festivals than amongst the general population, drug use isn’t increasing overall in the UK and yet UK drug-related deaths are the highest that they have ever been. This week we are seeing the usual scramble to ascertain the facts – the hastily compiled and unhelpfully vague press release by festival management rehashing the well worn phrase of a suspected “bad batch” in circulation, the frenzied social media speculation and rumour mill amongst understandably worried punters, and the easy jump to the conclusion that if The Loop was on site this tragedy could have been avoided. The causes of death remain unconfirmed and will continue to be shrouded in confusion until toxicology reports and inquests which could take another year or more. Understandably this void is filled with speculation and a search for answers. 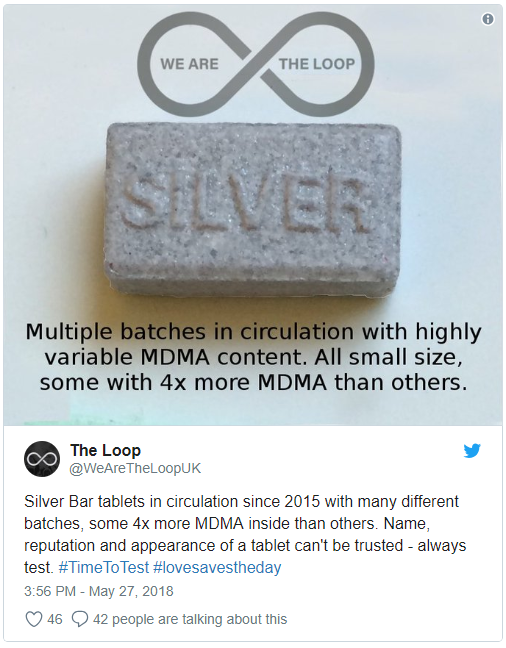 As Director and Senior Scientist with the Loop, a non profit social enterprise that provides the UK’s first and only onsite drug safety testing service, Multi Agency Safety Testing, we are clear that drug safety testing doesn’t have allthe answers but we are equally clear that drug safety testing can provide someof the answers to what is in circulation in the local drug market. Our service doesn’t condone or condemn drug use, it is a pragmatic harm reduction response to the realities of drug use on site at festivals, providing information so that people can make an informed choice. On site drug safety testing can raise awareness of the variations and risks of substances in circulation. Service users can drop off drugs which are subjected to fast, accurate forensic testing in rapid ‘real time’, and destroying the pill or powder submitted. The service user returns a little later and spends 15 minutes speaking to a health professional finding out what their substance was, then working one-on-one to identify the risks which most apply to them and how to mitigate those risks. Meanwhile, the extensive collection of data about what drugs are circulating in the local market enables us to post credible, evidence-based alerts on social media with the help of the police and event management. We can educate users, inform emergency services, monitor trends, and reduce drug-related harm onsite and offsite by working closely with all agencies involved. We saw this in action last weekend. The Loop tested over 200 samples in Bristol over 3 days of the late May bank holiday weekend. 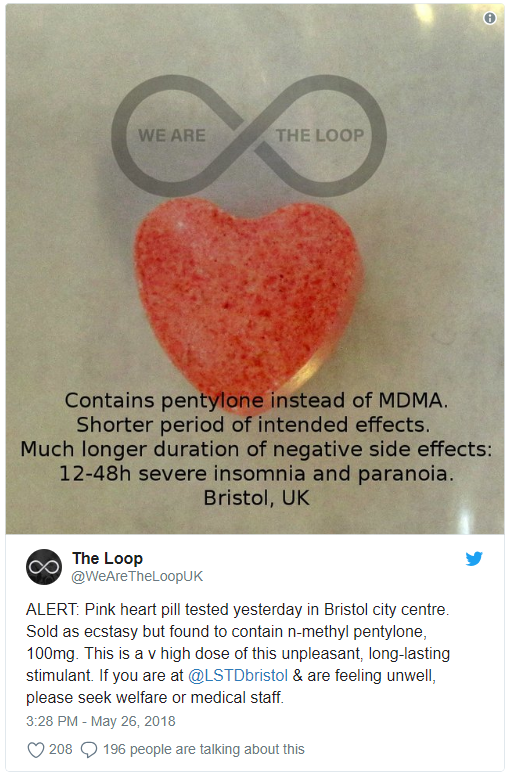 One in eight drugs had been missold by dealers so we were able to inform service users of this: for example, we tested pink, heart shaped pills sold as MDMA but actually containing over 100mg of pentylone, a strong dose of a very long lasting and particularly unpleasant stimulant-type New Psychoactive Substance. For more of the samples, though, the concerns related to how strong they were: for example, the cocaine and MDMA crystal were consistently very high purity and ¾ of pills contained more than an average adult dose of 120mg MDMA. 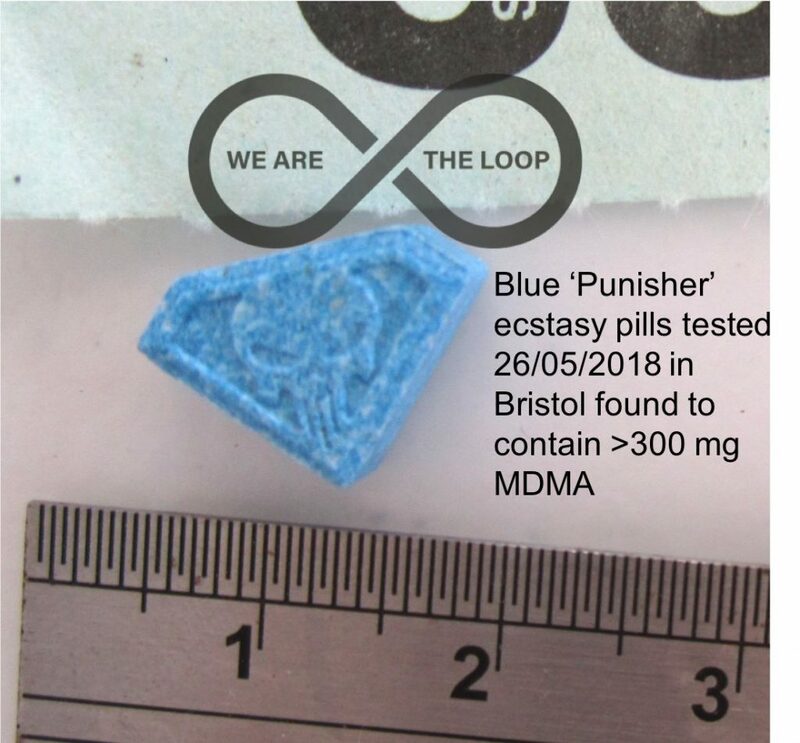 Social media alerts were issued, with police and event permission, for ‘Silver Bar’ pills at over 250mg MDMA and blue ‘Punisher’ logo pills at over 300mg MDMA (three times a usual adult dose) that have been linked to casualties in the area. And what do people do when we tell them this information? Half of the people who used our Bristol service told us they would take less or even dispose of their drugs as a result of talking with our healthcare workers – this can only reduce drug-related harm and hospital admissions which benefits everyone, users and non users. We have estimated elsewhere that a drug related death can cost up to £10k just for policing resources. The other point to emphasise on what was an unusually hot May bank holiday weekend is the importance of allowing festival goers access to free tap water. Licensed events have a legal duty under the 2010 Mandatory Conditions to provide free tap water yet time and again we see festivals and nightclubs paying heed to the letter but not the spirit of the law. Restrictions are placed on where water is available (poorly signposted standpipes on the periphery by contrast to the bars in the middle of the event) and how much water is available (small cups rather than refilling litre bottles). We are calling on all festivals this summer to follow best practice and go beyond the 2010 Mandatory Conditions – yes it will eat into bar profits but it might save not only a customer’s life but also the event itself. Festival closure, corporate manslaughter charges and bankruptcy are all very real possibilities in the face of a drug-related death on site. People want to know what is in their drugs, that is now clear, and they respond sensibly and appropriately when given the chance. Of course we can “just say no”, don’t take them but what if they persist? The answer is “just say know”. The Loop is just a small non profit social enterprise doing what we can but we could do so much more – in the Netherlands it’s a national and publicly funded service with over 30 offices across the country. We have the opportunity and the technology to do better than just warn off festival goers from another “bad batch” this festival season. *Guy Jones is Senior Scientist at the Loop.